Home Legal News Why Are There 2 Network Solutions “Under Construction” Pages? My guess is the owner was not receiving any of the revenue generated on clicks. If that assumption is correct, this means the landing page adds risk to the owner without any reward that I can see. Obviously having a landing page without PPC links doesn’t prevent the domain name from becoming the subject of a UDRP or other litigation (as evidenced by the UDRP filing). However, it is likely the complainant in the first UDRP will cite the PPC links and the complainant in the second wouldn’t have that type of evidence (unless the landing page rotates or changes). I am curious about why there are two different types of under construction landing pages from Network Solutions. You bring up a good point, enom once a domain expires, and others place the servers into ppc mode, very dangerous if you have a quality domain during grace period. Because NOTHING is simple at Network Solutions. Under Construction page, also known as a parked or parking page is a placeholder Web page for a domain name that is not yet attached to an active website. This placeholder page notifies visitors that your website is coming soon. 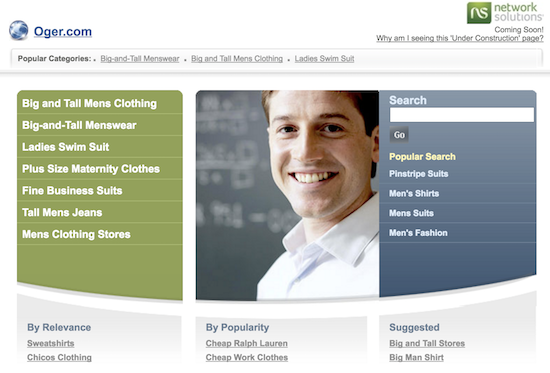 Network Solutions® provides customers with two types of Under Construction pages. The standard Under Construction page may contain promotions and advertisements for, and links to, networksolutions.com, Network Solutions products and services, third-party websites, third-party products and services, or Internet search engines. The generic Under Construction page contains only Network Solutions branding and may contain a Network Solutions domain name search box. Maybe YouAskedForIt.com is blocked upstream? Just like a domainer, Network Solutions seperates good names from pigeon sh*t. The good stuff that they keep gets the parking page, the bad stuff gets the stickman with a shovel. It’s the other was around. By default, Network Solutions assigns landing pages with advertising links. To get the “stickman with a shovel” construction page is actually a little trickier, as the option is not readily apparent in the Network Solutions set-up account page. Ironically, one has to dig around for the option to get that link-less page to display. Smart domainers that hold names, and are familiar with UDRP policy, don’t want trademark-infringing PPC links, that they can’t control, to be used against them in a UDRP proceeding. youaskedforit.com is a valuable name . . . interested to see what happens.